Harry Styles, of the group One Direction, has announced his tour plans for 2018, and it appears he will be quite busy putting smiles on many people’s faces. So far about 30 concert dates are scheduled for the early to middle part of 2018 (March, April, June, July), hopefully more dates will be added to that leg. Some of these concerts of his are international and a good amount are in North America. Harry Styles is mainly North America and includes states such as California, New York, Illinois, Tennessee, Massachusetts, Washington DC, Georgia, Pennsylvania, Texas and more, including some cities up in Canada. During his 2018 part of the trek, watch out because Harry Styles will be on the road with Kacey Mugraves. Now those will be some amazing shows! Even though he has left the band that helped sky rocket him to fame, Harry Styles has been working very hard. His new solo music has proved that he can definitely stand on his own two feet. Of course fans would probably want to see the whole group together and performing, Harry Styles solo will just have to do. I don’t think we’ll hear any complaints. 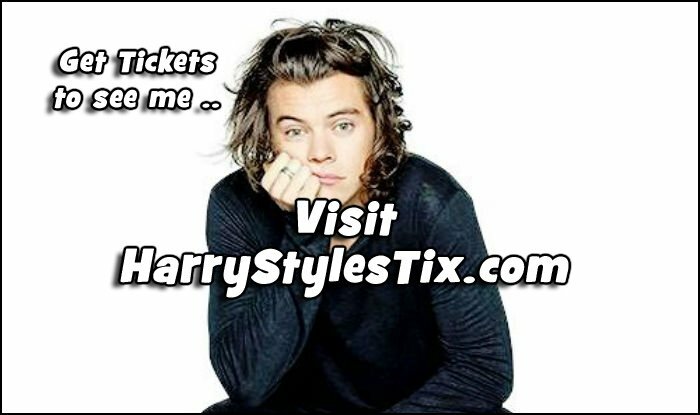 Check out below for the latest list of Harry Styles Tour Dates, links to look for tickets, plus some cool Harry Styles music videos. Don’t miss your chance to see Harry Styles live in concert at a venue near you! Secure Your Tickets Now! Check back often to see if Harry Styles adds any more additional tour dates to his schedule. Harry Styles is on tour in 2017 and 2018 & his fans are ecstatic. Do you think One Direction will ever reunion?